Four of Swords shares that stress can affect you now – the weight of your responsibilities may be too heavy. Seek advise from your higher self – pull back into solitude and consider the details of your situation calmly. Put your thoughts in order and determine your priorities – suspend action on all issues but “one”, ask your unconscious to work on this one issue and then sleep on it. Centering and meditation practices can help you create the objectivity required to see all sides of an issue and from this experience something useful and powerful will emerge. You will soon be back into action again – there will be good opportunities ahead. Always take the time to think things out carefully before you commit yourself to anything. When you find yourself experiencing opposition or find that it is difficult to get things moving – recognize that it is an indication that there is still “unrest.” Make no promises at these times, the situation can rapidly change. Allow yourself to return to life and activity now – emerge from your shell – other people may assist as they perceive and break through the protective walls you have built to protect yourself. There may be difficulty in this centering process, such as not being able to discern just where your progress to date has brought you or simply indulging in too much introspection/ thinking. Desiring too much mental abundance, mental greed. Do not try to over protect your mind or your ideas for they will wither and disappear as though they never existed. Misuse of order, discipline, authority, control, cleanliness. From what do you need to rest or retreat? Where do you need to focus your energies in order to recuperate your strength? What do you need to do to gain a better perspective and to be fair and just in this situation? What kind of professional assistance would help most? Next to any Ace: Re-evaluate your long-term plans – check everything carefully before going ahead with new ventures or your current situation. Three or more Court cards in the spread: Do not proceed with any new ventures unless you feel absolutely sure – you are still experiencing difficulties in a certain relationship. Next to Judgment: Take the time to understand this lesson, so that you can avoid any similar involvements – learn from the pressure you are experiencing. In the first position: It could fall to you to deal with the more severe distortions of this archetype, with disorder, lack of discipline, criminality for example. In the second position: In one extreme, not knowing when to quit can lessen your future potential. In the other extreme, you can work mentally toward realizing that you have more physical endurance than you think. 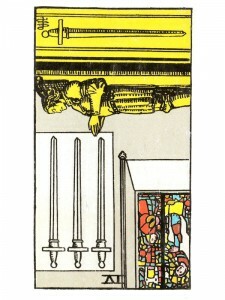 In the third position: There is an imbalance in this archetype for mental stability and foundation which the cards in the next three positions will help define. There may be a potential difficulty with the law. Or, simply that you are not yet prepared. Or, you are misunderstanding, misusing the principles of order and discipline. In the fourth position: There may be a tendency to hold on too much; or you may tend to let too much out. The passion for control and discipline can be distorted in numerous ways. Sexually, it can show up in sadomasochistic preferences, with you continually looking for someone to dominate or who easily dominates you. In the fifth position: On one extreme, you are not calm because you know you are not ready. On the other extreme, you are much too calm under the mistaken idea that you are more than ready. In the sixth position: Here is the effect of too much or too little order from your mental house. In the seventh position: Begin now to keep your eye on a valid goal and be certain you do not use inappropriate means to reach those ends. In the eighth position: Your mind is too much in charge or too little. If too much, there may be serious abuse of control, at the extreme causing physical damage to property or harm to others. There may be an inappropriate slacking off under the guise of rest and retrenchment. You are contemplating your navel. In the ninth position: Your gut, subconscious says you are not as on top of things as you might think. In the tenth position: One or more of the imbalances of this archetype will fall away as if by magic.